The SV binocular series is an inexpensive new product line from Kowa, released mid-year in 2011. 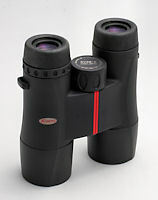 The line consists of six binoculars: an 8x32, a 10x32, 8 and 10x42 versions and two 50-mm versions at 10x and 12x. All are roof prism binoculars with the typical refinements of internal o-ring seals and nitrogen-purged interiors so they are waterproof, dust-proof and internally fog-proof. We are very impressed with the 8x32 and 10x32 models and this article concentrates only on those. So what do we mean by inexpensive? Well, the 8x32 and 10x32 Kowa SV binoculars sell for $200.00 and $200.00 respectively, which is at the lower end of pricing for any roof prism binocular with all the minimum necessary coatings. Okay, so what are those coatings? Kowa SV binoculars have fully multi-coated lenses, phase-coated prisms and a high-reflective prism coating for better light through-put. This is a lot of technology on a $200 binocular, with the result that they provide brighter views and sharper image quality with fewer downsides. One of the advantages of 32-mm binoculars is more compactness and less weight to carry around than a full-sized, 42-mm binocular. Kowa SVs are 5.8 inches tall with eyecups fully extended and just 4.75 inches across with the hinges fully open. They weigh only 20-21 oz. Additionally, the SVs have slender barrels with nice ergonomic flaring and shallow thumb grooves so they are very comfortable in the hands. All Kowa SV binoculars are clad in sturdy black rubber armoring to buffer against shocks, with red accents on the main hinge and the Kowa logo. The 8x32 SV binocular boasts a big 408-foot field of view at 1000 yards distance, while the 10x32 has a more pedestrian 315-foot field. Both models close focus to about 6 feet without significant collapse of the visual field. The SVs go from minimum close focus to infinity with about 1.6 turns of the focus knob, which is just about right for this character. We really like the design and smooth action of the focus knob, which has deep oval-shaped cut-outs in the rubber armoring that produce great traction under the fingers. We noted just a bit of garden variety chromatic aberration on brightly-lit objects, which is not very noticeable unless you specifically look for it. Field curvature was moderate and limited to the outer edges of the visual field. The 32-mm Kowa SVs are a bit short on eye-relief at 15.6 and 16 mm respectively for the 8x and 10x models. If you happen to wear thick eyeglasses, you might experience a little trouble but for most people, this will be adequate. For those who do not wear glasses, the eyecups adjust with the usual helical twist mechanism and go through two fully-stable positions between fully-in and fully-out, marked by nice, deep detents. The interpupillary distance range on both 32-mm SV models is about 56-74 mm, meaning they won’t cause most people difficulty finding a comfortable position on the face. The diopter adjustment is a simple twist-ring on the upper right barrel. Conveniently, there is a series of raised ridges on either side of equal to help you mark any setting you wish for unequal focal lengths, a nice little touch. The rainguard is the classic pair of soft rubber cups linked by a flexible bridge region that fits snugly and easily over the eyecups and doesn’t dislodge even when the binocular is inverted. The strap threads through a closed bracket on the left side and can slip onto the right side strap through a gapped bracket on that side. By contrast, the objective lens covers are rudimentary hard plastic, designed to protect the lenses when the binocular is stored in its case. Do not take them into the field as you will lose them. 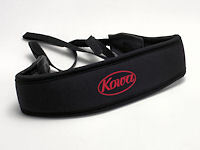 The strap is a hybrid of padded foam ligated to a narrow cordura strap. It is more than adequately comfortable on a binocular this light. The case is spacious and simple: a padded nylon affair with a Velcro-closure on the flap. The strap can hang out the open sides allowing the whole assembly to be worn over a shoulder. The case also has a belt attachment loop in the rear. Nothing is fancy here, but certainly very functional. We feel Kowa did a great job of maximizing optical performance on these SV binoculars while minimizing production costs to keep the overall price low. That spells value to the customer, pure and simple. These are practical binoculars with surprisingly good optical performance and we feel comfortable recommending them to anyone.